Review of several new books for gear engineers. 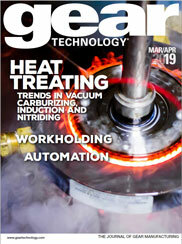 Heat Treating - The evil twin of the gear processing family. Heat treating and post-heat treating corrective processes can run up to 50% or more of the total gear manufacturing cost, so it's easy to see why, in these days when "lean and mean" production is the rage, and every part of the manufacturing process is under intense scrutiny, some of the harshest light falls on heat treating. This is the second in our series of interviews with the leaders in the gear industry. This interview is with Dennis Gimpert, president of Koepfer America, South Elgin, IL. For heat treatment of tool and alloy steels, the end-user has a wide range of basic types of heat treating equipment to choose from. This article reviews them and details the criteria that must be considered in selecting equipment for a specific application. In making this choice, the most important criterion must be the quality of the tool or part after processing. The passage last year of both NAFTA and GATT has gone a long way toward leveling the playing field for American manufacturers and other hoping to compete in the global economy. Add to this news the fact that the domestic economy keeps growing, and it seems as though good times are ahead for the gear industry.